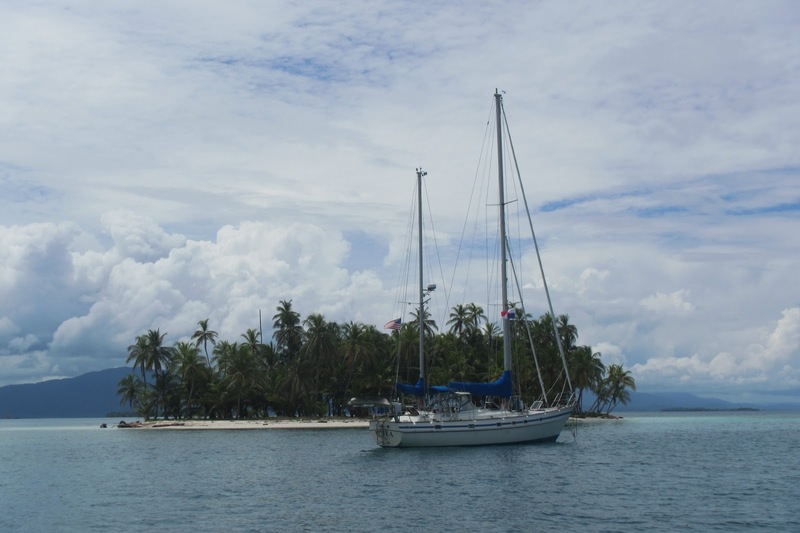 We had been eager to visit the San Blas Islands for years but after our trip to San Diego, where we had a fabulous visit with family and friends, it was more of an effort to develop enthusiasm to sail eastwards, even if it was only 70 miles. Our Panama Canal transit was weighing on our minds and the thought of only being 2,700 miles from home was a calling that was hard not to hear. Still, we managed to rustle up the energy to cast off the dock lines (in 25 knots of wind) and sail out of Puerto Colón and into the western Caribbean. Of course, the wind soon died and we had to motor most of the way to Isla Grande, arriving late on a Saturday afternoon. There was still enough light left for me to clean the propeller as it was badly fouled with barnacles from sitting in Shelter Bay Marina for so long (cleaning while tied to the dock in Shelter Bay wasn’t an option as there are crocodiles in the water there – we’ve seen them). It would have been helpful if our built-in hookah was working but after so many years of nonuse, it wouldn’t run so I had to clean the prop by free diving. Note to self: Avoid arriving at a tourist destination on a weekend night unless you want to listen to very loud music all night. The next day was an easy passage to Cayos Chichime and even though some cruisers disdain the location as too popular, it was a delight for Ruthie and me as it represented the quintessential destination: Clear, warm water, small palm-covered islands, good sand holding, mill pond-like anchoring, no loud music and friendly locals. 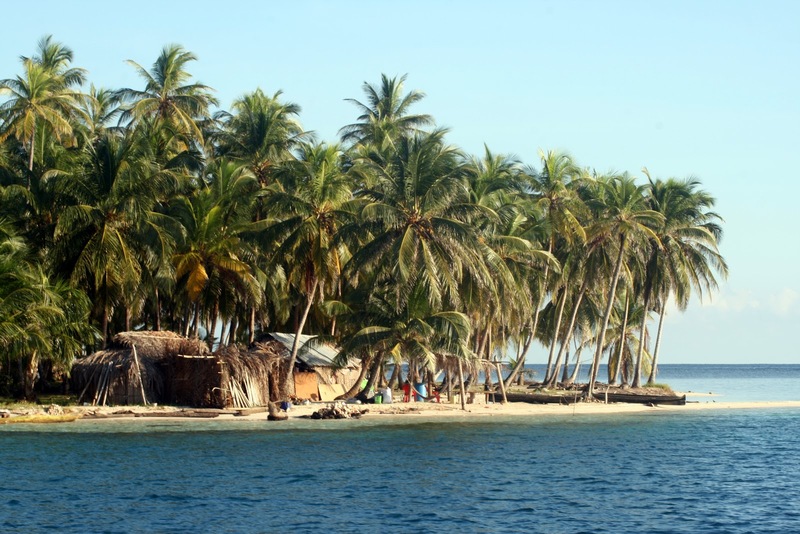 One of the big draws for our visit to the San Blas is that they’re populated by the Guna Yala, a people who still live simply, shunning many modern conveniences like electricity. Of course, there are Guna Yala who use outboard motors on their crudely-built canoes and one family brought us their iPad and iPhone for charging but many still live traditionally. 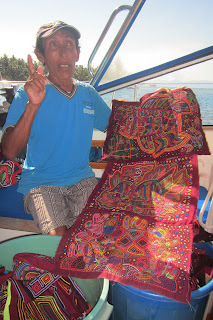 What is unique and distinctive among the Guna Yala are the beautiful molas that they sew and wear. Made from layers of brightly colored cloth, the molas are embroidered by hand and can take months to complete. 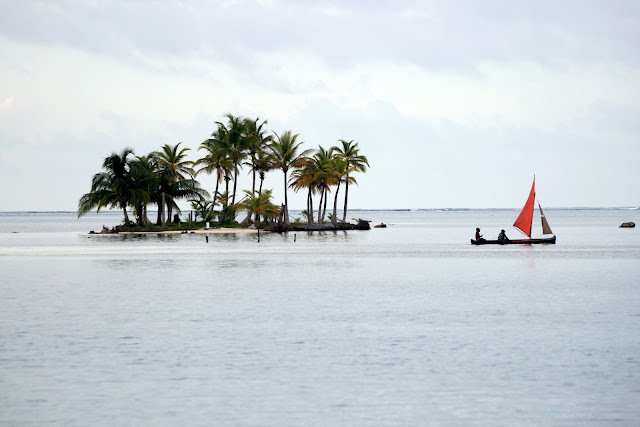 While still anchored in Cayos Chichime, we were approached by two men in a canoe who asked if they could come aboard and show us their molas. We found them to be stunning and searched through dozens and dozens before picking out fourteen. I choked a little as I counted out the cash (Panama uses the US dollar as their currency) but we were delighted with our purchases. Before leaving, one of the men gave us his card and it read ‘Venancio Restrepo’. Later, as Ruthie was reading our Lonely Planet guide for Panama, she found a paragraph that said don’t miss the molas made by Venancio Restrepo. 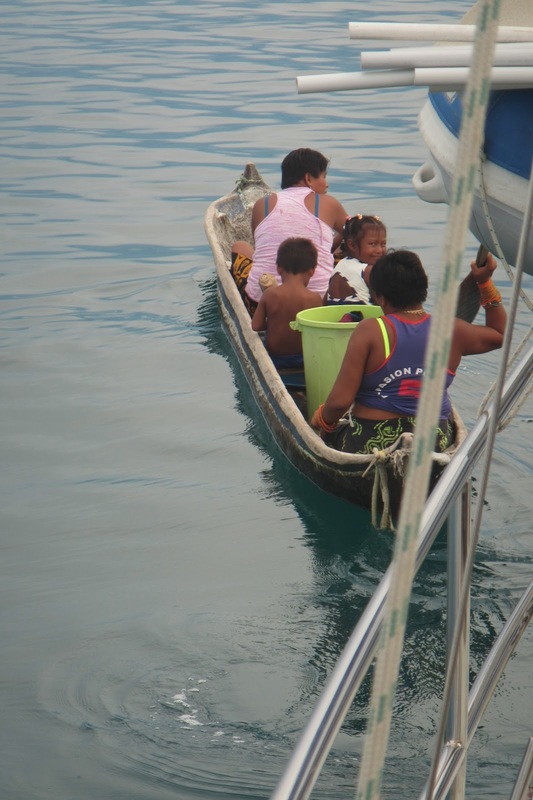 Moving still further eastward we found islands more remote and less populated, both by cruisers and the Guna Yala. In the Cayos Holandes, we found some excellent snorkeling only to be told later that the area is well populated with crocodiles. Our snorkeling routine changed immediately and we only went with other cruisers, one of whom would stay in the dinghy, armed with a loud air horn to warn those in the water of an approaching croc. We never saw one but others had and it was enough to make us cautious. Throughout our stay we were visited by locals, many times offering us fish, crab or lobster but sometimes just coming by to say hello or ask for a drink of water. Large, live lobster typically went for US$5 each and one time a group of young men came by with two huge Caribbean crab. When I asked how much for the crab, one of the men quickly said, “Ten dollars.” and then just as quickly said, “Eight dollars.” I asked, “Two for fifteen?” and a smile swept across his face as he accepted my offer. 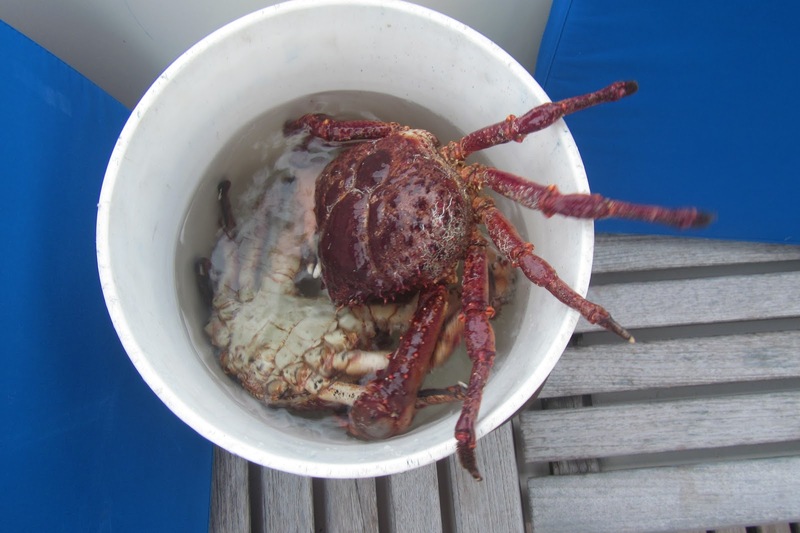 The crabs were so big that I could only cook one at a time in our large, 15-quart pressure cooker. The crab was fabulous and we ate it for days. 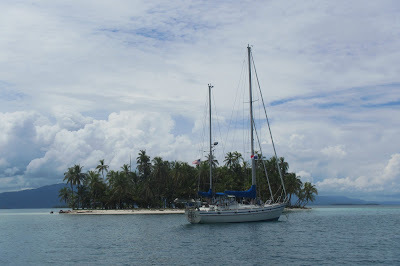 One aspect of the San Blas Islands that we found disappointing was that many cruising boats seem to be abandoned there. We would see boats that appeared to have had no attention in years, their names and hailing ports erased. The Guna Yala would be helpless at getting these vessels removed as ownership would be almost impossible to prove and salvaging would be stratospherically expensive. Granted, there are many responsible cruisers there who have made the San Blas Islands their home (we met one couple who had been anchored in the same spot for thirteen years) but some have taken advantage of the kindness of the Guna Yala and exploited it. It’s a terrible form of pollution. On our way back to Shelter Bay Marina, we stopped for the night at Bahia Linton, a spot that is very popular with the cruising fleet – probably over 60 cruising sailboats at anchor. We had no contact with anyone and left the next morning. Once we arrived back at Shelter Bay, we learned that three cruising boats had been victims of armed robberies in Bahia Linton just recently. 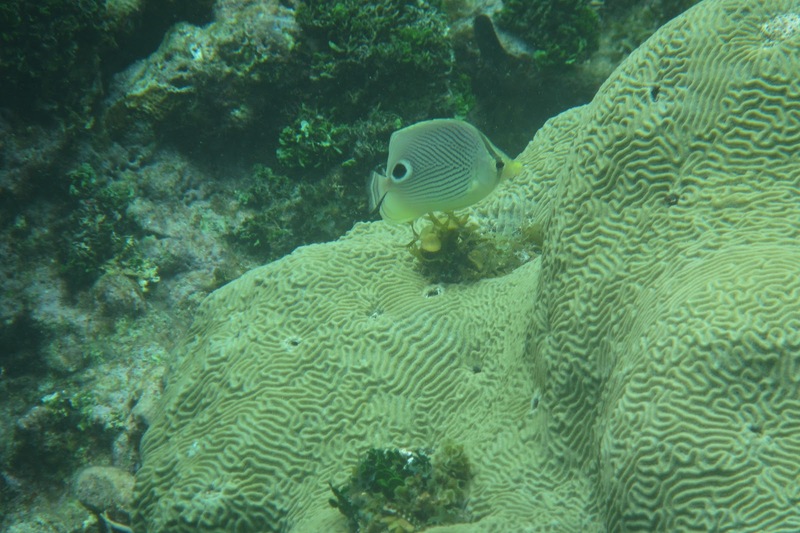 Back in Shelter Bay, our focus was now on our upcoming transit of the Panama Canal.